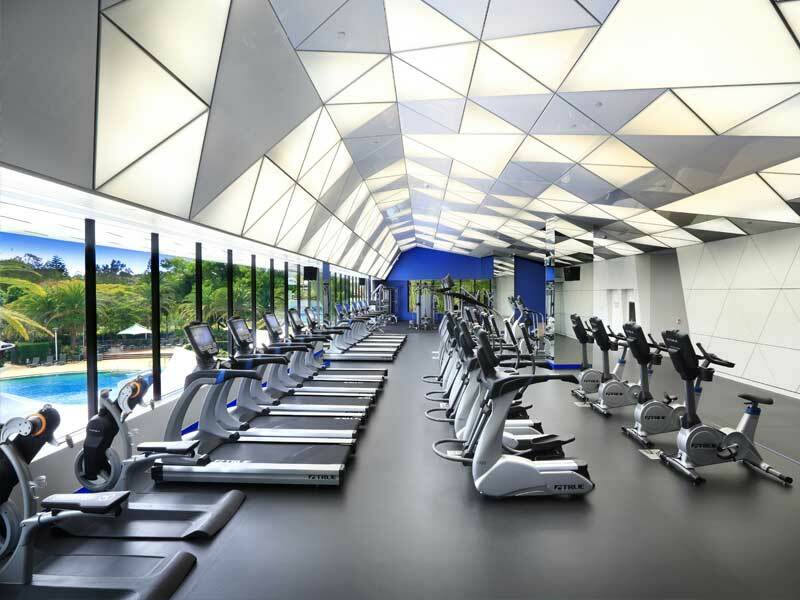 Stay, play and completely unwind at RACV Royal Pines Resort! Surrounded by a sprawling 27-hole golf course, lush vegetation and incredible lakes, this resort is a tranquil oasis set in a world of its own, between the Gold Coast’s coastal hub area and the green hinterland hills. Enjoy mountain views and plenty to do—this is the ideal place for the whole family! 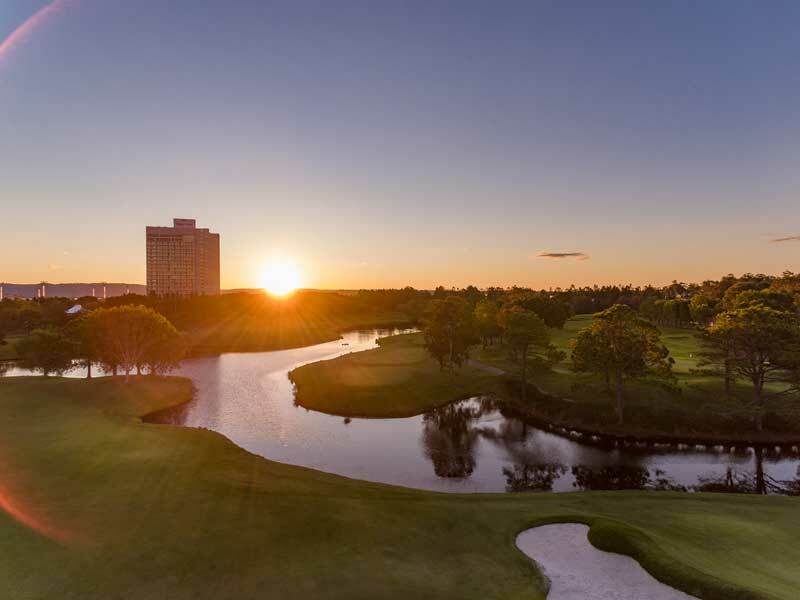 RACV Royal Pines Resort is tranquil, sprawling and the ideal place to escape. Located less than 8km from the Pacific Motorway, 5-minutes from Metricon Stadium and just over a 12-minute drive from the stunning beaches, shops and attractions around Surfers Paradise, this exquisite resort offers guests the best of both worlds. Think peace, quiet and absolutely everything you need. 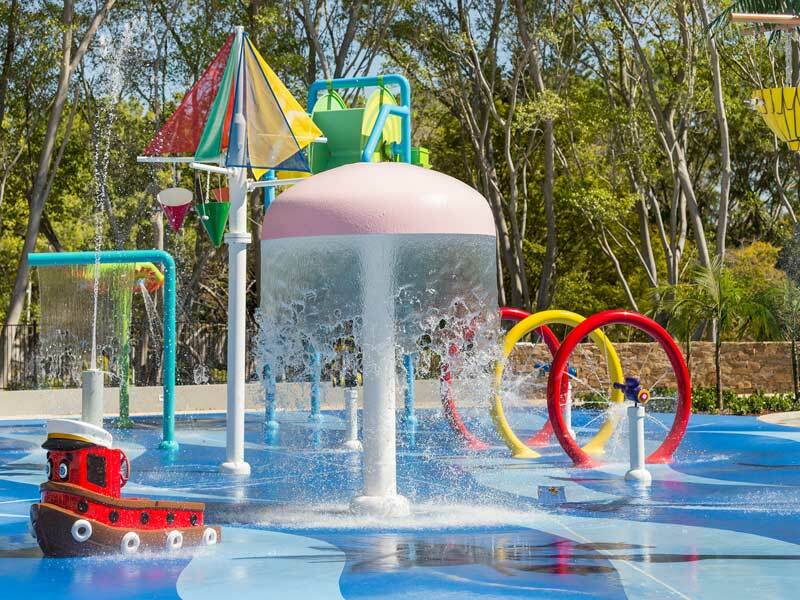 RACV Royal Pines Resort allows all guests, no matter their age, to stay and play and feel ultimately content. The facilities at RACV Royal Pines Resort include the 27-hole golf course (which plays host to the Australian PGA Championships), 8 bars and restaurants, the revitalising One Spa, One Spa Hair salon, a state of the art gym, 5 international standard tennis courts (with Pro Experience Tennis Tuition), multiple pools (including a heated lagoon pool for year-round swimming), a waterpark, playground, Segways, clay shooting and so much more. Add to this a dedicated shuttle, to take guests to some of the Gold Coast’s best shops and attractions, and you’ll never have a dull moment here! Why go to RACV Royal Pines Resort? RACV Royal Pines Resort’s facilities alone are enough to sell even the pickiest of travellers, but there’s even more to love about this incredible resort! All of the rooms and suites here are spacious and well-equipped. Boasting incredible views of the grounds or the dazzling city skyline, these sleek and modern rooms contain everything you could desire. Make yourself at home and enjoy the large, plush beds, wide-screen TVs with in-house movies, individually controlled air-conditioning, minibar, complimentary newspapers and more. 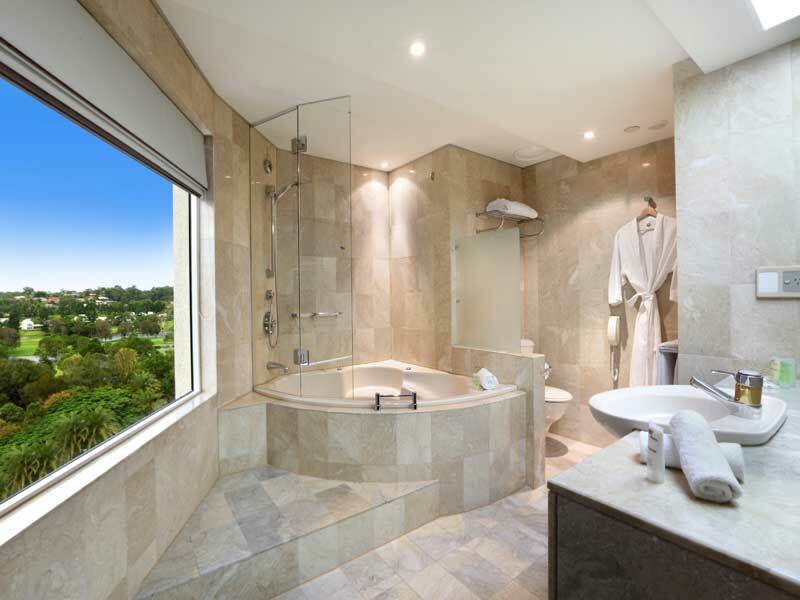 RACV Royal Pines Resort has rooms close to the golf course, two-bedroom family suites and everything in between. If you want to take your stay to new heights, access the Executive Lounge on Level 21 of the resort. 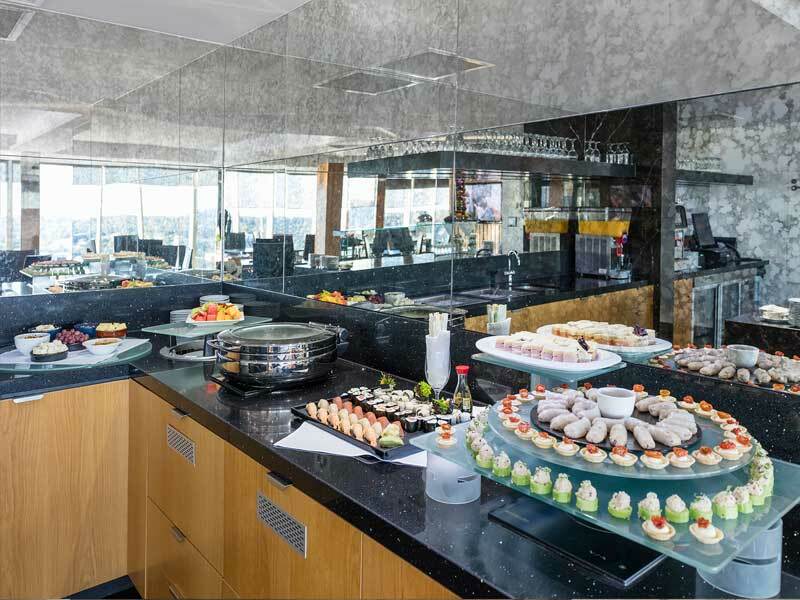 Here you can revel in Gold Coast city views, valet parking, a full buffet breakfast, light daily refreshments and evening canapes and drinks. Executive Lounge guests can also access the area’s private meeting areas, which boast contemporary James Moran furniture. 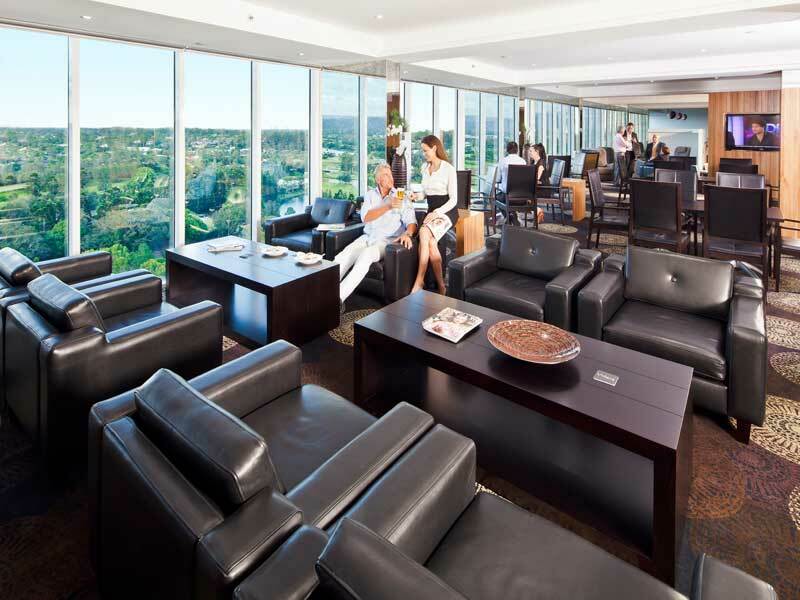 This lounge is available to RACV Club Members and Executive Room guests between 6am and 11pm. Wake to expansive hinterland views in your luxurious Suite with Spa Bath. Boasting an impressive 55sq. metres of space and gazing down upon the pool, golf course and the resort’s lakes, guests can get a real sense of place here! Sink swiftly into plush King bedding, start and end each day in your luxurious marble bathroom with in-room spa tub, keep cool in air-conditioned comfort, access Wi-Fi and more! 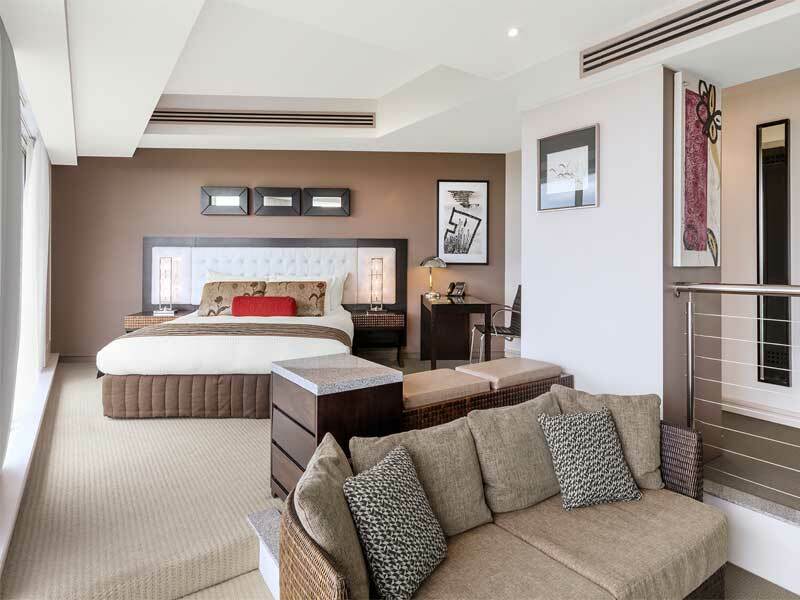 Suite with Spa Baths also feature a mini bar, coffee and tea making facilities, an iron, robes and slippers. They can accommodate up to 3 guests, with a rollaway bed available on request. 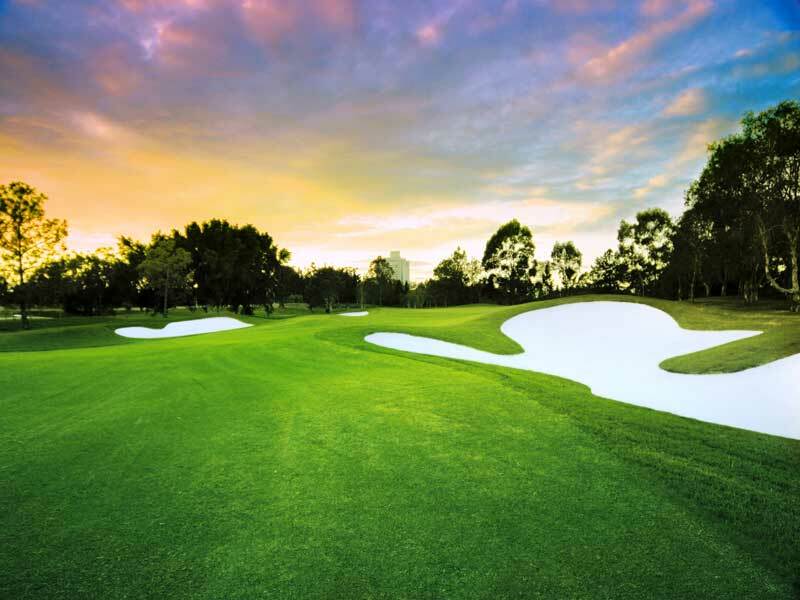 The best of the Gold Coast waits for you at RACV Royal Pines Resort. Located in Benoa, almost exactly half way between the stunning Surfers Paradise beach hub and the refreshing Gold Coast Hinterland, this resort allows guests to relax and unwind in ultimate peace and quiet. 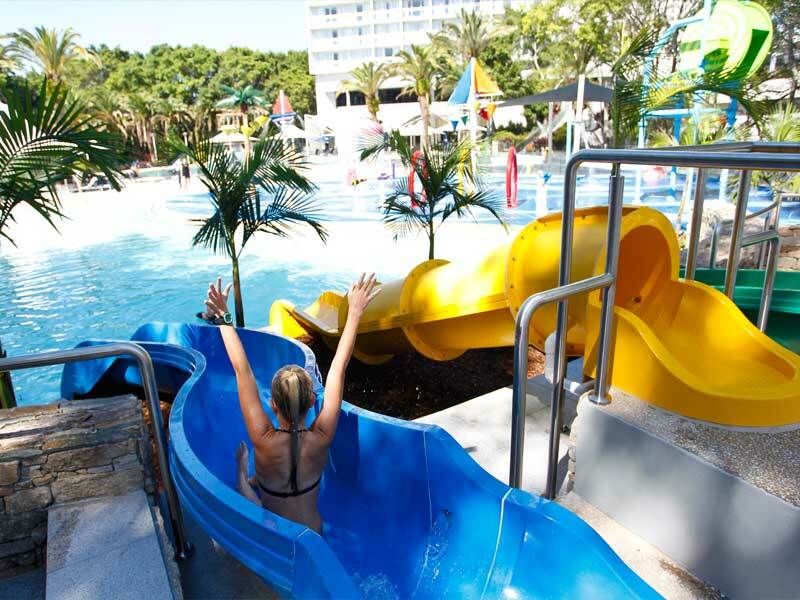 The resort is set 32km from the Gold Coast airport and 80km from Brisbane, making in accessible for both interstate and stay-cation travellers. All the attractions of Surfers Paradise, including the golden stretch of beach, are less than a 15-minute drive away; Metricon Stadium is 5-minutes away and the 27-hole Royal Pines golf course is just steps from the accommodation! Whether you’re planning a fun-filled family getaway, a golfing trip or a romantic escape just for two, you’ll find plenty of things to do at, and around, RACV Royal Pines Resort! Drive around 15-minutes in any direction and you’ll find yourself at the site of a range of attractions. These include the famous Gold Coast theme parks; Pacific Fair shopping centre; fabulous stretches of golden surf beaches; and all the restaurants, bars, shops and attractions of Surfers Paradise. If you’re a golfer, test your skills on the 27-hole PGA golf course. This stunning stretch of greens allows for three unique 18-hole combination golf courses, plus there’s a Golf Shop, golf coaching and a driving range available. If tennis is more your thing, play on one of 5 courts, then cool down in your choice of stunning pools or splash around in the waterpark! 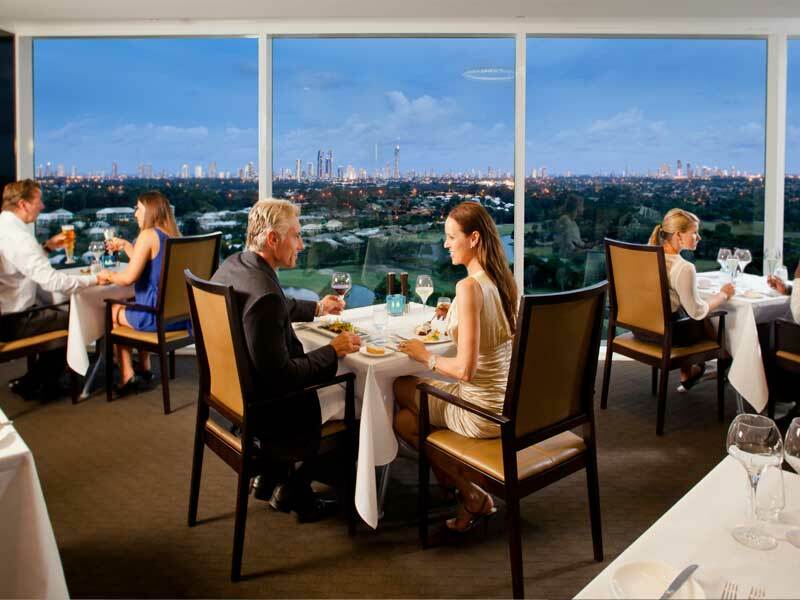 The dining options at RACV Royal Pines Resorts will keep all types of guests satisfied—from the poolside bar, to Tee’s Clubhouse, the Panorama Lounge, casual dining, Japanese and romantic fine dining set up on Level 21, you’ll find the ideal place to indulge and refuel! Another wonderful family holiday at this resort that has all bases covered. Clean and modern accommodation, excellent pool area for the kids and great meal options—lamb shank at Trattoria Amici was my favourite. Be sure to make the most of the shuttle service into town (complimentary for auto club members). Our driver Andrew was super friendly and gave us some local insights. Wonderful stay and regards to all the wonderful staff!